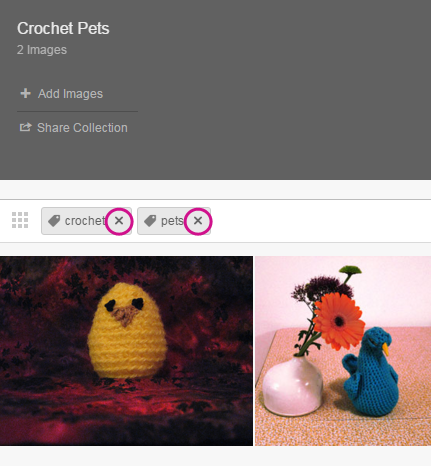 You need to add images to a place and tag or categorize them before you can create a collection. Collections can be created by filtering by tags or categories. Collections use image tags, categories, and author. Tip: Tagging and categorizing your images when you add them let you use them in collections. For more information, see Adding images to places. To edit an existing collection, select that collection from the Collections library at the top of the page first. Add images to your place by using Images > + Add images. 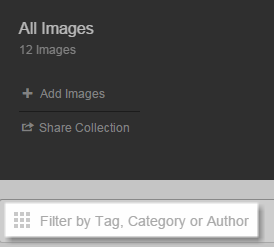 Once you see a few images on the Images tab, then click in the Filter by Tag, Category or Author area. From the menu, you need to filter all of the existing images before creating your collection. Select tags, category, and authors until you've added filters that produce the set of images you want. Note: Each collection can have only one category and one author. If you select a new category or author, it will replace the current one. Remove any existing filters that you don't want to use. If you want, select a different sort order from the Sort by drop-down menu. 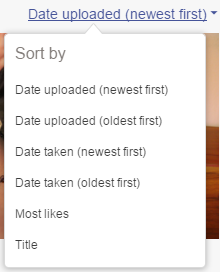 By default, collections are sorted by Date uploaded (newest first). With the collection created, you can share your collection with other community members. For more information, see Sharing collections. If you are a place owner, you can save your new collection, too. For more information, see Saving collections. Tip: If you don't have permission to save a collection, share the collection in a message to yourself to view it later. For more information, see Sharing collections.